Considering a Nelson Custom Guns 1911 .22 conversion. I'm thinking I'm about to pull the trigger on a Nelson Custom Guns .22 conversion for my Les Baer wadgun. It will be for Bullseye, to establish the common platform across rimfire, centerfire and .45. I'll be going from a S&W Model 41 for rimfire, so this conversion kit has to be good for Bullseye, not just plinking. Who out there can comment on actual Bullseye performance of this conversion? Any one ever see one on a Les Baer wad gun? With the sight bridge? 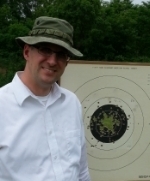 Looking for some comments from hands-on experience with this conversion and shooting Bullseye. Re: Considering a Nelson Custom Guns 1911 .22 conversion. Nelson has my whole hearted support. I have three. 1. Nighthawk now with a Nelson barrel. Larry Nelson is great to deal with. Tell him your use intended and maybe ammo available. They all work fine on 3 different Les Baer frames made up by Roddy Toyota. Is accuracy from the Nelson on par for capable Bullseye competition? I'm not familiar with the "sight bridge". Do you plan on using it for the .45 and .22? If so you do someone here will surely advise feasibility or if it must be removed resighted etc. I'm sure the LB is a good idea but know little about the Nelson tho all comments have been good. I shoot a Bob Marvel Custom Pro. He designed all the conversions in use for BE I believe. Chuck26287 wrote: Who out there can comment on actual Bullseye performance of this conversion? Any one ever see one on a Les Baer wad gun? With the sight bridge? When you say sight bridge are you talking about the frame mounted scope mount on the LB wad gun pictured below? If so, even if any conversion fit under the mount you will have a different POI (point of impact) when you change slides. Part of the beauty of the Bob Marvel designs is they keep their POI when removed and reinstalled because the sights or optic are mounted to the barrel portion of the slide, which doesn't move. Nelson Custom Guns is manufacturing the latest of the Bob Marvel designs incorporating all of Bob's improvements. Another bonus is all machining is being done by McMillan Machine (their rifles and actions are works of art). As stated above Bob designed this conversion for Bullseye. I am in fact ordering a Nelson to replace my Marvel Unit 1 non-lockback . Yes, what I referred to as a "sight Bridge" is the frame mounted scope mount pictured above. 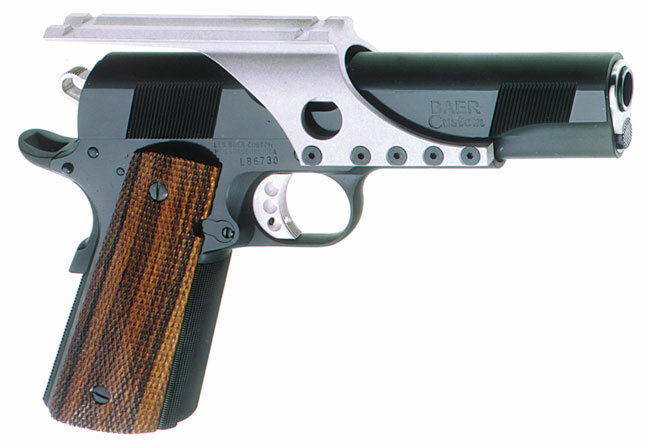 Mine is the standard Les Baer Wadgun, just as pictured. I've always referred to red dots as a "dot sight", as it has no magnification, and only provides an aiming aid, compared to a scope, providing a crosshair reticle and magnification. Sorry for the confusion with semantics. I realize there's an issue of POI when changing slides. This gun is still very tight. When I've taken the .45 slide of to clean it, and put it back on, I don't think I've ever had to make a sight adjustment. So, as long as I can determine with the red dot adjustments where its position is, I should be able to adjust to the conversion's POI, then back to the .45's POI when replacing the .45 slide. As long as my red dot is repeatable in its adjustment mechanism, I should be able to have one basic setting for .45, and one for the conversion. There will possibly be some variability in the way the conversion fits on the frame. If it doesn't go on the same way each time, it may require a slight sighting in each time installed, but should be stable once engaged with the frame. Since I'm shooting a frame mounted dot vs a slide mounted dot, I do loose the advantage of the sights to barrel relationship being fixed. That issue all comes down to one thing... the new Les Baer that I could actually get my hands on had the frame mount (it's their standard model). They would build it with a slide mount, but frankly, when I have to wait 18 months for something I need, for all intents and purposes, it's not available. This is what I could get. This is what I have. Larry from NCG emailed me back last night. I'll be calling to talk this over with him later today. Should be some good info. ....seriously, Les Baer wouldn't sell you their frame mount gun and simply add the slide mount rail without giving you a long delay? I recommend you do just that. Order your favorite slide mount and have it drilled and tapped by a gunsmith near you. Just run the les baer with the frame mount removed. There just isn't a practical way for you to use the conversion in conjunction with that frame mount. That's not how it's designed to work. Oh I missed the part about the frame mount. Went in one ear and out the other. With no real thinking on this, why couldnt you mount the conversion sans the rail or rib. It would look kind of Beretta like. There has been a guy local here that shot a Kart minus the top. Holes were tapped straight in the barrel for weaver type bases. If you can swing it the best course IMHO would be to find a 1911 receiver/frame ready to go, or build one rather than changing around on the LB. I have seen frame prices quoted and they can be quite stiff by the "pro's". They offer esthetics for the most part. I bought an Essex SS frame ready to go for the conversion for $400. It was what it cost the seller to put together. I added a trigger job by my favorite 'smith and it runs fine. I currently use skate board tape for the grip front. Follow one of these strategies and you will have 2 guns which you must have in time regardless. One can add checkering or other non essentials as the situation changes-progresses. And of course a used gun bought right would serve. Shipping 2 ways, insurance and LB's rates would add up to a nice start on either of the suggestions above. I started BE in 1968 and soon had 2 ea .22's & .45's from John Giles, one new and one used of each. Finer guns you couldn't ask for. I soon learned that the no of rounds I was firing led to needing .45 top jobs, then an HB gun, pistols modified for red dot sights etc. it was necessary to locate a smith who could produce faster and cheaper. The shooters at Canton McKinley were using Jackie Best and so I followed their lead. He put a Kart Brl in a gun, tightened as needed and sent the gun back in a wk or 10 days w/ a 2" group included. I have found there is about always somebody around close who can do BE gun work and it is necessary that you find them. Become their friend. Do what ever is needed and it will serve you well. Just another 2 cents which may not be worth that. Jack, the OP could mount the conversion without it's rib under the sight bridge, but given the fact that he would be switching back and forth, the zero will be different from the .45 to the .22, but because of the way the conversion tightens against the slide stop pin, there is no way to get the .22 to have the same zero from time to time--or even from shot to shot. The reason the zero is repeatable the way the conversion was designed to be used is because the sights are bolted to the barrel. you just don't have as repeatable of a connection to the frame. No argument that s-canning the frame mount is the way to go. Personally I do not like them. Jerry's side mount seems an ok idea. But I like my dots as low as can be. I even want the low advantage that a 1" dot gives over a 30mm. Ultradots of course.